Well…can you believe it…it’s Saturday already! Where does the week go? We have been busy over on Create with Connie and Mary Summer Collection 2014 this past week and since it is Saturday, it is time for our Saturday Challenge! This past on Create with Connie and Mary I used the Traveler stamp set for my project (remember, you have to be a subscriber to see that) so I used it for my Saturday challenge. This week we have a fun sketch challenge for you! Flashback chevron print – 3 x 4 3/4. Lay it on your card base on a diagonal and trim. Add to card front. Very Vanilla – 3 1/2 x 4 3/4. Lay it on your card base on a diagonal and trim. Stamp the boat using Pool Party. Use your Alphabet Rotary Stamp to spell out MISS YOU and stamp using Real Red. Had a Basic Hodgepodge Clip to top and add panel using dimensionals. Cut strip of Basic Black Grid dsp 5/8 x 4 1/4 and add to card front (NOTE: left side is added using dimensionals). Punch out heart (Itty Bitty Accessory Punch Pack) out of Real Red and add using dimensionals. 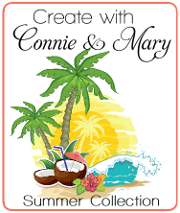 We have just finished week 3 of Create with Connie and Mary Summer Edition 2104! This collection features products from the NEW CATALOG…you don’t want to miss it! If you are looking for some great ideas for the items in the NEW CATALOG, then this collection is for you! This entry was posted in Create with Connie and Mary and tagged Alphabet Rotary Stamp, Traveler. Bookmark the permalink. Love how you used this stamp set with this sketch! Such a great CAS card!! 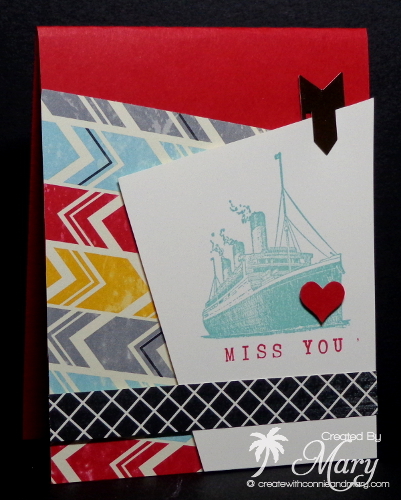 I love that you combined a vintage style stamp with bold DSP. And using the Rotary Alphabet stamp for the sentiment is brilliant!